The Edwardian years, 1890-1915 was a very fashionable era thanks to King Edward VII (1901-1910). King Edward carried England, with the United States and France following, out of the Victorian era, upon the death of Queen Victoria in 1901. As King Edward was more accessible to the common laborers and women through his travel and his propensity to socializing, the Edwardian years are claimed past King Edward’s death up to the sinking of the Titanic in 1912, and ending around WWI. The Edwardian fashion was looser fitting, mobile, and flexible, no longer requiring the breath-taking corset and high backed bustle. These fashionable confinements were replaced by more comfortable form fitting bodices, larger sleeves and ankle length skirts. Day wear, or casual wear often included, that as seen on Nola in this 1912 photo, the bodice with a high collar, commonly called a “shirtwaist” during the Victorian and Edwardian periods. The original meaning of shirtwaist was based on the bodice (waist) having buttons down the front like a man’s shirt. This may give us, as genealogists, one more way to date photos through clothing. 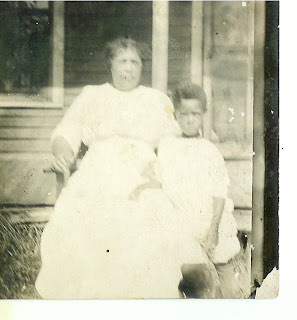 See posting Morris Porter with Grandmother Nola (Morris) Wells Jackson for information on infant clothing for this period. The Sears Catalog offered over 150 version of the The Gibson Girl shirtwaist. It was the ideal of feminine beauty at the turn of the century, and by 1905, the Sears Roebuck catalog offered 150 versions of the high-collar, back-buttoning yoke style blouse . For larger women, the Gibson Girl clothing was impossible. While the Gibson Girl style that focused on the slender, athletic woman was being redesigned by dressmakers throughout the states, Lane Bryant lead the Nola Morris full-bodied shaped woman out of the Edwardian era into the Flapper era by 1915. Nola Morris, 9 Mar 1896 Rutherford, North Carolina died 6 Aug. 1923, Anthony Kansas. Fitting the Edwardian description of an emancipated and beautiful girl, she was married twice. She married Leander Wells in Cocke County TN, at the age of 15, four months pregnant with her first of four children. Having moved to Kansas with her four young ones in tow, Nola married James Jackson in 1905. Family folklore maintains she was too head-strong for a husband. 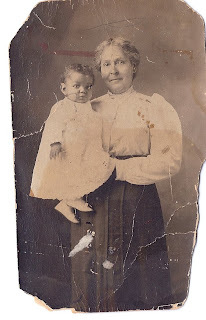 Nola died 6 Aug. 1923 in Anthony, Kansas at the age of fifty four due to heart complications. .
Part I, Infant Fashions of Edwardian Years, 1908 - 1914. 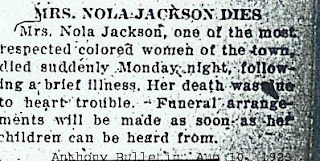 Nola Jackson birth, marriages and death information is on file with author.